"Rhubarb summer refresher. A yummy blend of rhubarb and raspberries surrounded by a brown sugar and oats crust. Serve warm with vanilla ice cream or pour on some half and half." This had great flavor, but turned out a bit runny. I suggest using a 9x9 pan, increasing the amount of 'crisp' and maybe thickening with a little more tapioca or corn starch. Will make again. Holy sugar cubes! I love sweet stuff, but this is bordering on too sweet. I used a 9X9 pan and will make it again, but will most likey cut the sugar in half! As my three year old says "balicious"! Very good way to use rhubarb. I used frozen fruits and just cooked it a little longer, and I did not use tapioca, still balicious. Absolutely delicious! Took it to work today and everyone loved it, some are taking home leftovers and others have asked for the recipe. 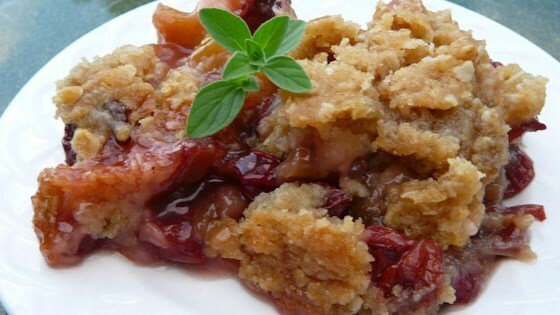 Quickly became my favorite rhubarb recipe!